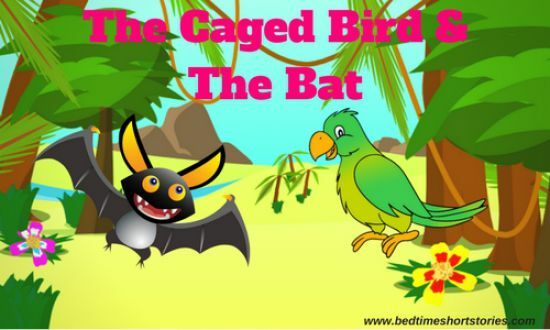 This is the fable short story about animals with moral lesson for kids. Once upon a time, there was a farmer who had a parrot at home. The parrot spoke well and everyone liked it. In the same house, there lived a bat. He too liked the parrot. One night, when everyone was fast asleep, the bat heard someone singing sweetly. “What a beautiful voice!” he thought. It went outside to see. “Where is this voice coming from?” he thought to himself. The bat finally saw the parrot singing. He was very happy to see the parrot. Also, read The Bat And The Weasels. “Hi, You sing very sweetly. Your voice is very sweet!” said the bat. “Thank you!” said parrot happily. “I will get a fruit for you as a present for you, for your sweet song!” the bat told the parrot. Soon, the bat left the place. The next morning, the bat came with a fruit to the parrot. “Thank you my friend!” said the parrot. The next night, again, the parrot started to sing. “Again, here comes a sweet melody from my sweet friend,” cried the bat. The bat went and met the parrot. “Hi, you started to sing again?” asked bat. “I love singing!” exclaimed the parrot. “But, why don’t you sing in the morning then?” asked the bat. “There’s a big story behind that!” the parrot said. The parrot continued, “One day, I was on the field and singing happily. attracted by my voice, a hunter came and caught me. I had forgotten my surroundings while singing and had not seen the hunter. Now, look at my fate. The hunter sold me to this farmer.” Hearing this, the bat started to laugh and said, “Don’t misunderstand me! You are already in a cage. Even if you sing in the morning, who is going to catch you?” “You are right! But if someone else takes me away from here?” asked the parrot. “No one will take you from here!” concluded the bat. “Oh, dear! I should have thought about it long back. I will start singing in the mornings too from tomorrow!” said the parrot happily. The bat gave another fruit to the parrot for his sweet voice. Now, the parrot sang any time he wished for. This continued for the rest of their days. You may also like to read, The Two Parrots. MORAL OF THE STORY: PRECAUTIONS ARE USELESS AFTER THE CRISIS.